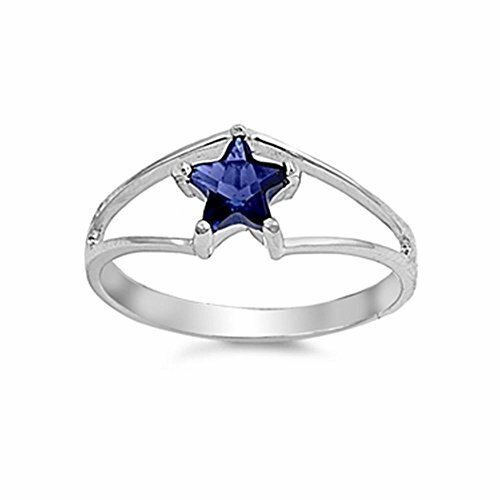 Sterling Silver Simulated Blue Sapphire Star Wonder Woman Style Ring, 3mm. Made of Sterling Silver, Rhodium Plated. All jewelry collection pieces are personally curated and closely inspected prior to being sent out to customers to ensure perfection and complete satisfaction. Metal Material: Made of Sterling Silver, Rhodium Plated. Quality: All jewelry collection pieces are personally curated and closely inspected prior to being sent out to customers to ensure perfection and complete satisfaction. If you have any questions about this product by Glitzs Jewels, contact us by completing and submitting the form below. If you are looking for a specif part number, please include it with your message.